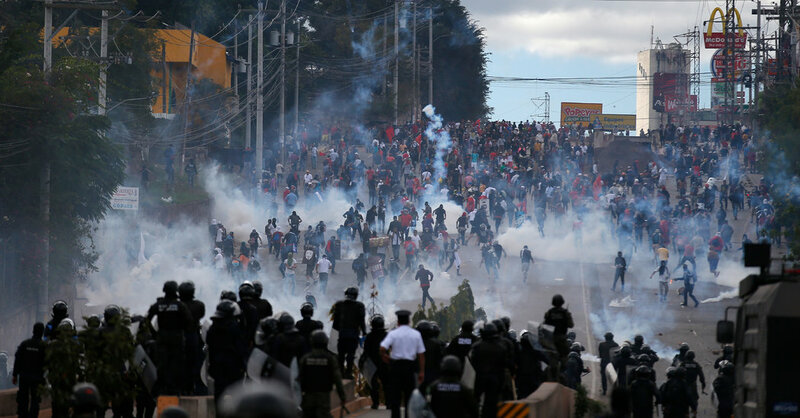 The Inter-American Commission on Human Rights and the Office of the United Nations High Commissioner for Human Rights in Honduras have called on security forces to stop what they called the “illegal and excessive use of force” to break up protests. This past week, both organizations reported that human rights activists, journalists and others continue to face threats and harassment. In addition to the disputed results, the opposition also argues that Mr. Hernández never should have been on the ballot in the first place. What put him there was a ruling by the Supreme Court, which lifted the Constitution’s ironclad ban on presidential re-elections in a circuitous ruling two years ago. The five judges who made the decision all owed their positions to Mr. Hernández. The president has steadily taken control over much of the government, filling independent institutions, including the Supreme Court, with his allies. Critics said a law passed by Congress this month showed that the postelection turmoil has not dissuaded him from continuing to amass power. A tear gas canister near a protester on Saturday. The law targets the attorney general’s office, which has been pursuing high-level corruption cases, working with an international panel that Mr. Hernández was forced to accept after months of antigraft protests in 2015. On Jan. 18, Congress all but shut down those cases, effectively pulling the attorney general’s authority to investigate the theft of public funds destined for social projects. Juan Jiménez Mayor, a former prime minister of Peru, who leads the anticorruption panel, denounced the law and said it would block investigations into as many as 60 current and former Honduran legislators, as well as high-ranking officials in the government. Among them, Mr. Jiménez said, is the powerful president of Congress, Mauricio Oliva, a close ally of Mr. Hernández. The opposition candidate Salvador Nasralla, right, and former President Manuel Zelaya, with supporters on Saturday. Already a judge has dismissed cases against five former legislators who were charged with embezzling government funds, citing the new law. Mr. Jiménez said the law could lead to the release of Mario Zelaya, the former head of Honduras’s main public health agency, who is accused of stealing as much as $300 million. Some of that money found its way to Mr. Hernández’s 2013 presidential campaign, though he has denied that he knew the source of the funds. Mr. Hernández has not commented on the law, but few in Honduras believe that he played no role in its approval. “This is a decision taken at the highest political levels of the country and it is irreversible,” said Edmundo Orellana, a former attorney general and professor of constitutional law at the National Autonomous University of Honduras. Opposition supporters blocked a road in Tegucigalpa.